The Crawleys are coming back on the big screen, and now we know just when to expect them. Focus Features will release the Downton Abbey movie in North America on Friday, Sept. 20, 2019, with an international release from Universal Pictures International scheduled for one week earlier on Friday, Sept. 13, 2019. The forthcoming movie will reunite the original principal cast of the hit series, which ran for six seasons until 2015. Downton Abbey creator Julian Fellowes, who is also returning, wrote the screenplay and will produce alongside Gareth Neame and Liz Trubridge. Series pilot director Brian Percival will executive produce alongside Nigel Merchant. Michael Engler, who directed four episodes, will also direct the movie. The series follows the British aristocratic Crawley family and the servants who work for them at the titular Edwardian country estate. It quickly became a sensation beyond the U.K. thanks to its rich period costuming and a breakout performance from Dame Maggie Smith as Lady Violet Crawley, the Dowager Countess. 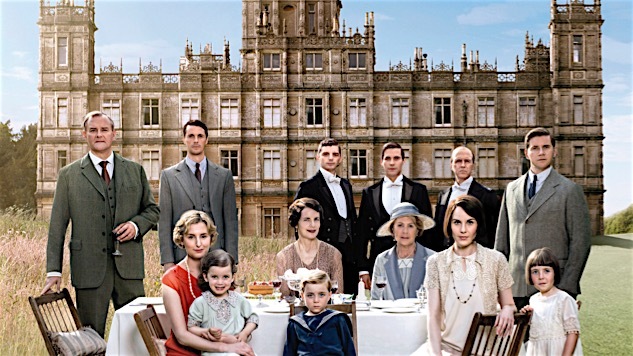 Downton Abbey also broke records as the most-nominated non-U.S. series in Emmys history. News of a Downton Abbey movie broke last June, with Focus Features confirming in July that the highly anticipated movie would start production this summer with the original principal cast returning. While next September is indeed far away, eager U.S. fans should be relieved to learn that unlike the original series, they’ll only have to wait a week to get the Downton Abbey movie after it reaches everyone else.